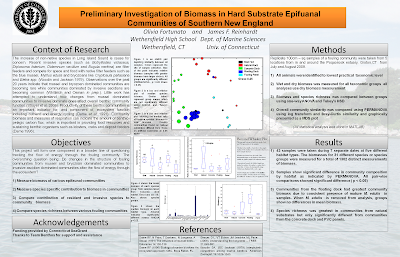 This past summer I worked with a high school student on a Connecticut SeaGrant funded project to gather preliminary data of the biomass of hard-substrate epifaunal communities, also affectionately called fouling communities. It was a great pleasure to work with Olivia Fortunato, I only hope that she got as much out of the project as I did. The research we did this past summer has laid a great foundation for future work investigate biomass and energy flow in benthic communities.